As a former Digital Brand Marketer, I've been a big fan of both Deep Focus and The Cassandra Report for quite a while. At Pepsi, I used the report to help anticipate how best to reach my core consumers, and specifically my growth target audience, ages 18-24. The current release of The Cassandra Report helps marketers better understand how to develop deeper connections with young consumers through digital brand communications. They also discuss how to use messaging channels like apps, and why a brand's approach on these platforms should be very different than on social networks. I recently sat down with Jamie Gutfreund, CMO of Deep Focus to talk about the report and the biggest takeaways for brand marketers. My first question was about the history of The Cassandra Report and how they see brands using the data. "Most brands today have more data than they know what to do with. We actually call this the white binder syndrome - we frequently see "white binders" filled with unimaginable amounts of data that literally sits on a shelf and provides a fraction of the value that it could if translated into true insights." "What marketers need is a way to turn data into insights that can help them create new products, buy media or engage their audiences in creative ways." The Cassandra Report is a syndicated research study that leverages Deep Focus' proprietary quantitative and qualitative research to deliver insights for 14-34 year old consumers. We don't just tell brands "what" consumers are doing we take it a step further to help them understand the "why" behind their preferences, behaviors and actions." For Jamie, the biggest takeaway in this release of the report is the importance and preference for more intimate online communications shown by younger consumers. "We are in a new digital era where younger generations are shifting the online world from the "public square" to a more intimate environment, and bringing a human touch to the web in the process. For brands, this means a marked shift from relying on just mass marketing initiatives to an opportunity and need to forge more personal relationships with customers and fans." 1. Today, web users are getting to know strangers on an emotional level and 35% consider these "E-lationships" just as valid or real as those that exist in person. 2. Young consumers are taking a more empathetic approach to web browsing adopting an Ethical Click mindset in which they're thinking more carefully about how their individual online actions affect others. 49% of Gen Y feel badly after clicking on/reading gossipy/negative content. 3. 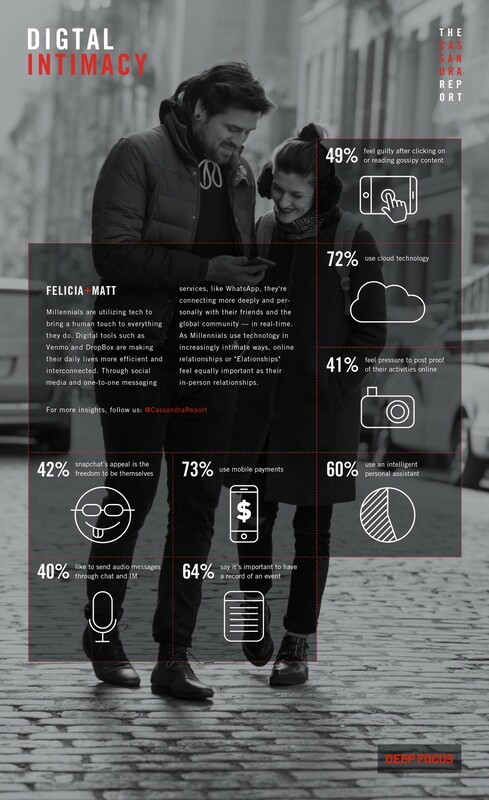 Gen Ys and Zs longing for a greater sense of closeness online is manifesting itself through new habits documenting their experiences, in fact, 51% think about what they are going to wear everyday based on how it will look in photos. So how can brand marketers respond to these findings and impact their own communications planning? Jamie thinks there are ways for brands to cultivate more meaningful brand connections with younger consumers by creating a greater sense of intimacy in their digital communications. "While social media allows marketers to share their messages with the broadest possible audiences, these "general" approaches on their own may not always leave a meaningful impression on consumers. That's not to say brands should stop engaging via social platforms, but they should consider augmenting them in more private or intimate spaces." 1. Having more direct conversations via chat apps enables brands to have a louder impact and create stronger bonds with the right people - their true fans rather than shouting to everyone. 2. At a time when "digital intimacy" can be a powerful tool, keep in mind that young consumers don't want to be sold, they want to develop relationships with the brands they care about. I thoroughly enjoyed my time with Jamie and look forward to catching the next release of The Cassandra Report. Jamie told me that the next report will address Gen Z – consumers 17 and younger who are not just younger versions of millennials. Since the Cassandra Report has been studying young consumers for almost 20 years, they have the ability to provide some unique perspective on this upcoming group of consumers by comparing this new research with data from when millennials were at the same age. You can follow @CassandraReport and CassandraDaily.com for daily insights and "micro-trends" on topics raging from the latest tech devices to new retail strategies. I'm a city girl. I know urban grit, packed public transit, and the aggressive undercurrent of survival mode. In the Swiss Alps, surrounded by the imposing summit trio of Jungfrau, Eiger, and Monch, I woke up from my city daze. And so began my career as a novice mountain climber. Since that tourist stint in the Alps, I've successfully summited many big peaks, including Rainier, Cayambe, Cotopaxi, Aconcagua, and, most recently, McKinley. As I reflected on my climbing experiences, I realized the parallels between my climbing hobby and my decade-long career as a marketing strategist. To my surprise, I've been refining my expertise in the mountains all along. Both require goals, diligence, planning, calculations, and teamwork. High-altitude climbing requires a goal—realistic enough to achieve, but lofty enough to motivate. Climbing McKinley took me five years. That meant a lot of glacier traveling, rope team experience, rescue technique practice, and being totally comfortable being uncomfortable before I ever set foot in Alaska. The same concept applies to developing a marketing plan. Goal setting sets the tone for the rest of the process—the goal is the backbone to the strategy, which then establishes the action plan for getting there. For example, if your goal is to deliver more efficient customer communication, your strategy might emphasize people, process, and technology aspects of how those communications are planned, created, and implemented. Activities such as selecting a better marketing automation tool; identifying resource, process, or data inefficiencies; and better integrating your customer database with your campaign management platform could help you achieve that foundational goal. But if your goal is to completely transform the customer experience, your marketing plan could look very different. While people, process, and technology solutions still apply, the focus becomes improving the customer's relationship with the company. Do customers get a seamless experience across channels and touch points? Is the message and the experience consistent? Is the experience—product, customer support, promotions—personalized enough? Though much of my 100% summit rate can be attributed to good luck, it was also thanks to my diligence. I trained like it was life or death. Social events were deprioritized in favor of extra hours hauling 60 pounds up and down the stairs. 10- to 12-hour weekend hikes—bright and early every Saturday morning for months—meant driving several hours north of NYC and sometimes sleeping in the trunk. I calculated weight-to-calorie ratio to select the food I'd carry. I even practiced using fake toilets. Due diligence also applies to marketing strategy. Only after thorough investigation can we prove or disapprove our hypotheses, refine our strategy, and convincingly support our detailed recommendations with the what, the how, and the why. Take the previous example of transforming the customer experience. Defining the future state and the plan to get there requires a thorough understanding of what's going on today. Developing a comprehensive current-state assessment includes a number of considerations, including business assessment, technology and data structure assessment, customer research (both qualitative and quantitative), and competitive and industry assessment. Project management is a secret weapon in mountaineering. Big, lofty goals are made doable when broken into smaller bits. The only goal for day one of a three-week expedition could be organizing the gear for cache strategy. Day two could be moving camp up 4,000 feet. Day three could just be about eating and resting. And so on, until you (hopefully) tag the summit and safely return. Similarly, a multi-week customer journey map project, for example, starts with a comprehensive project plan to ensure key work streams are planned with enough time and resources. Because customer journey maps span the entire lifecycle to pinpoint where a brand wins or fails its customers—thereby helping clients decide how to prioritize their budget—various work streams provide a holistic view. We evaluate current communication plans, segmentation models, user experience, and performance across all channels and segments, and enhance existing insights with additional customer research, such as focus groups, in-depth interviews, ethnography and social media scan. In extreme mountain environments, where each step is a decision between life and death, risk analysis is an essential part of the game plan. Professional climbers make go or no-go decisions after discussing objective hazards like avalanche conditions and rock/ice falls, weather windows, condition and ability of every climber on the team, and potential barriers, such as inclement weather, terrain, snow conditions, in the days to come. It's never as simple as the snow stopped. Let's move! Determining how to spend budget is similarly complex and multi-dimensional. Developing an executable multi-year investment roadmap is never as simple as that idea is super innovative. Let's do it! Each initiative requires careful analysis. What is the business impact? What's the ROI? Is there a competitive advantage? What is the effort required? Do we have the right resources? How expensive and how technologically complex is it? The final multi-phased recommendation requires a holistic view of all initiatives in consideration. For example, technology contingencies may require certain initiatives to be prioritized. Educating resources to enable certain initiatives to happen may require additional time. Glacier traveling in a rope team requires a lot of trust. Add in extreme weather, oxygen deprivation, and fatigue and that umbilical cord can be just as life saving as it can be deadly. I need to know that my teammates are just as prepared, technically proficient, and dependable as me. A few hours below the summit of Mt. McKinley, a climber on an affiliate team suffered a heart attack. At 19,000 feet, even resting is difficult—imagine trying to move a body. While we were incredibly lucky that the weather allowed for a helicopter rescue, everyone's patience and combined strengths allowed for a flawless rescue. Trust is also a significant driver of success in marketing strategy engagements, as various specialized expertise are required to produce an end-to-end solution. For example, contact plan development, which typically follows a customer journey map, requires specific skillsets. The customer engagement consultant is responsible for customer research and journey creation. He or she partners with other subject matter experts (SMEs) to create an executable contact plan. The email SME, for example, enables email best practices, including cadence, timing and tool configuration, while the tech architect ensures that various platforms, such as the email platform, customer database, and content management system are properly integrated. Now, who wants to go climb and strategize with me? Dawn Scata is a Marketing Strategy consultant in the National Customer Engagement practice, specializing in developing customer experience strategies and omnichannel roadmaps and communication plans. Happy #ValentinesDay from your Rebels!